I received a very kind & affectionate letter from Uncle David yesterday enclosing me $100.00 from him & offering more as Mr Dehon was not in the City. He also wrote desiring me to come and stay with him as a prisoner if possible; he said he had received a letter from Mother which was “as a star in a cloudy night” & the only letter received from any of the family in over three years. he himself is in very feeble health & walks with difficulty with the help of a stick but all of his family are well. Mr Dehon is also in very bad health & consequently spends but little of his time in Boston but is expected there every day. Uncle David’s address in No 40 State St Boston Mass. Mr Sumner he writes has been dead about three years. With the help of the $100.00 I will get along very well. I wrote asking Mr Dehon to get me a pr of pants jacket & vest of grey cloth which will make me quite comfortable. The only drawback or want experienced is books but I think I may buy some. I have sent for Shakespears works pocket edition. I am in hopes of hearing at any day from home. Never forget to write particularly how is the health of those at home & the Devereux family. I am in very good health & only very anxious to get exchanged. Write frequently and address your letter to Capt W. H. Hatch Asst Agent of Exchange War Department Richmond Va or to Col Ould & they will be sent here. Write if my horses trunks & Pompey got home safely. My best love to all dear Father. Last evening I received yours of 6th inst informing me of your captivity & destitute condition. At the earliest moment this morning I sought Mr. Debow, who is absent. I am sorry I cannot come to you in person, but I am a cripple, barely able to totter about with help of a stick. I however enclose five twenty dollar U S treasury notes, & send them by what I believe to be a safe & speedy conveyance, hoping they may ameliorate your condition till you can hear from Mr. Debow. You do not say that you are hurt & I trust therefore that you are uninjured. Mr. Debow is expected home daily, and as soon as he arrives I will inform him of your situation. His health is not good & he is absent a great deal on that account. I suppose it cannot be contraband to add that my family are well & all desire the kindest remembrance to you. Your namesake on the hill has been dead nearly three years. We had a letter from your mother a few weeks since the first for three or more years. It came by permission of the authorities & was like a star in a cloudy night. Write me when you can, and let me know if I can do any thing to render your condition more comfortable. If the thing is possible we should like to have you here, as prisoner, if on no better terms. What do you say. Your son Capt Burgwyn was captured by the Enemy sept 30th near Chaffins Bluff. 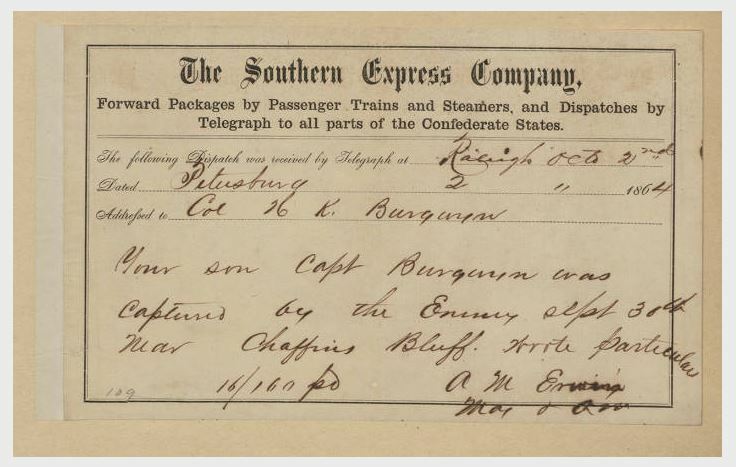 Telegram sent to Raleigh from Petersburg. North Carolina State Archives, WHS Burgwyn Papers. Yesterday our force was defeated in a general fight with the enemy. My division lost two thirds of its total number. Yesterday our force was defeated in a general fight with the enemy. My division lost two thirds of its total number. The Legion lost 75. Lieutenants Welch and Ashley are killed. Captain McKinney and Capt Singleton, Lts. Young, Jule and George are all captured. There was a stampede of wagons at night. wE travelled all night. The troops are now in line at the breastworks. Source: Christopher Watford, ed. The Civil War in North Carolina: Soldiers’ and Civilians’ Letters and Diaries, 1861-1865, Volume 2. (Jefferson, North Carolina: McFarland & Company, Inc., 2003). Diary of Major William Stringfield, WW Stringfield Papers, North Carolina State Archives. The 2d day this is and our rations gets no better we get half a loaf of bread a day a small slice of Pork or Beef or Sault Beef for Breakfast for Dinner a cup of Been Soup and Supper we get non Mr. A. Morgan of South Carolina has a vacon Cook House which he has bin teaching School in every Sunday and has prayers evry morning befour school we have a Preacher to evry Division in the Camp. Mr. Carrol preaches to our Divi which is the 8th. This is the 5th day of the month and we are going to have Been Soup with onions in it to day for dinner we will have Potatoes and Onions boath tomorrow the Dr had them sent in here for rebs to see if they would not stop Scirvy My health is very good to day which is the 6th of Sept. 64. But I cannot tell how long it will remain so for it is a raining and very coal to day An I have not go eney shoes.